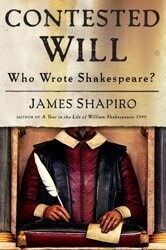 James Shapiro's new book, "Contested Will: Who Wrote Shakespeare? ", is now available. Read The Independent book review here. Or if big words frighten you, read the CNN puff piece. Listen to the James Shapiro discuss the book below.